Daft Punk takes a nap on a keyboard. If this album proves anything, it's that it's human to be lazy. And since they are "human after all", I guess that means that it gives them a free pass to create a lackluster album -- which is what they did. Am I saying I hate this album? No, that's not what I'm saying at all. What I am saying is that Daft Punk has deemed itself a sluggish duo now. In fact, I'm inclined to say that this album is not a group of songs, but a collection of experimental loops that were dragged out for supposedly "maximum potency". If they didn't go into overkill with their loops, this album could be heard in under 25 minutes. 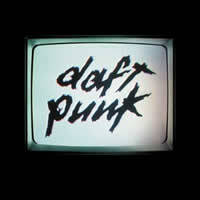 The album starts off simple with the title track, Human After All, which is the spiritual descendant of "Harder, Better, Faster, Stronger" from their 2001 album "Discovery". However, it's not quite as catchy. Again, it takes the road of the seriously vocoded voice (but it's grittier this time around), alongside a possibly false electric guitar and some retro synths. This song REALLY could have been cut to three minutes though, as the two-minute ending with the word "Human" being repeated over and over again in different octaves gets old fast. It became a single though, so they HAD to cut it. Daft Punk didn't even alter the tone of the sample with the same quality as they did in "Harder, Better, Faster, Stronger"! There are even points where the voice goes so high, one could discern what it was saying. Minimalism takes its toll on the Punks in The Prime Time of Your Life. The minimalist approach they take is certainly unique, and this IS one of the more innovative of the tracks on the album. Brandishing a horribly flanged beat and a vocoder/talkbox combination of kooky lyrics (also in that "Harder, Better, Faster, Stronger" style), this is certainly a force to be reckoned with. After a while, it drops the vocals, adds a sweeping kick, and then speeds up the song until it is beyond recognition! Was that really necessary, or were they just filling up CD space? If real guitars are what you seek, you may find some enjoyment in Robot Rock. This uses a powerful guitar riff (and a bubbly lead synth) as its main hook, and it sounds rippin' awesome, but it is VERY repetitive. This, too, could have been shortened to two minutes, and we'd still have missed out on nothing. I do particularly appreciate the vocals over the guitar -- "ROCK! ROBOT ROCK! ROCK! ROBOT ROCK!" Still, that does not detract from the overly lazy feel of this track. But it's nothing compared to a couple of other tracks on this album which feel like the ultimate slothenly production set, including the next track, Steam Machine. It's pretty sad when a song sounds VERY dated upon its INITIAL release. "Steam Machine" is a monotone piece with no melodic advancement at all. Interspersed within the song is someone whispering "STEAAAAAMMMMMM... MACHIIIIIIIINE..." and it sounds like it's being steamed out of that person. Weird. The beats are kind of infectious, but the monotone bass synth that they use without much modification (aside from a bit of slicing in the middle) just makes this a less-than-pleasant excuse for a song. Make Love is quite the detour, however. It's a much more contemporary track until anything played so far. It is a simple loop of smooth guitar plucking, heavy snare use, and a soft piano. And after a while, a mysterious voice chimes in, saying "Love... love... make love..." That's sound advice if I ever heard it. It, too, is VERY repetitive after a while (it's more of a concept than a song), but it's more low-key this time, so it's more tolerable to have it loop for almost 5 minutes. Yet all is not forgotten. Remember that "ultimate slothenly production set" I was talking about? Well, first there was "Steam Machine", but it's not as bad as The Brainwasher. I loathe this track, and I find it almost unlistenable at times. Behind a freaky masked ripply voice that says "I am the brainwasher!" (without even explaining more) lies yet another monotone bass synth. There is no progressive advancement in this song, save for an uberspacey pad that might come in. It's just a gruff song with no inspiration at all. And On/Off isn't even a song at all -- it's just nineteen seconds of someone flipping TV channels! What's the deal? That's extremely lazy to put that there (especially on an album with only ten tracks). Following this crap (yes, CRAP) is Television Rules The Nation. Although it initially caught my attention as something cool, I eventually realized that it's just a rip-off of the style from "Human After All", but without any exciting progression. A vocoded delivery of "Television... Rules the nation..." over a filtered electric guitar and retro-synth. I must point out, though, that even though this song IS as repetitive as the others, it doesn't FEEL repetitive. That's odd. You may recall the next song from those iPod commercials. It's Technologic -- y'know, the one where that high-pitched voice says "Buy it, use it, break it, fix it, trash it, change it...", etc. etc. etc. The voice is really the only hook for this song, and that feeling doesn't really last very long. Lots of people like this song. It just never caught on with me. Meh. And the grand finale this time is Emotion, similar in tone to "Make Love", but with actual progression! It starts out with a very flaky cheesy synth repeating the same few chorded notes, and then a slightly fuzzed voice starts repeating "E-MO-TIONNNNNNNNN" over top. Then the bass kicks in. And then a very tough but stable kick completes the ensemble. That plays out for a while, and then the aforementioned sequence is duplicated. Why, Daft Punk, you could've cut this in half! It's a nice and endearing way to end the album, but still, it feels like filler! So what can I say? This album was written over a period of six weeks -- perhaps they should've used a bit more time to craft REAL and complete songs. No, no, wait... not a bit more time, but a LOT MORE TIME. A year, maybe two! Then perhaps they wouldn't have released such an embarrassing follow-up to one of dance music's finer moments. Daft Punk really needs to get its act together, or else they'll be flushed down the toilet like so many other passé artists.